Clara Mattei is Assistant Professor of Economics at The New School for Social Research. She holds a PhD jointly from the Sant'Anna School of Advanced Studies (SSSUP) in Pisa, Italy, and Université de Strasbourg, Ecole Doctorale Augustine Cournot in Strasbourg, France, an MA in Philosophy from Pavia, and a BA in Philosophy from Cambridge University. 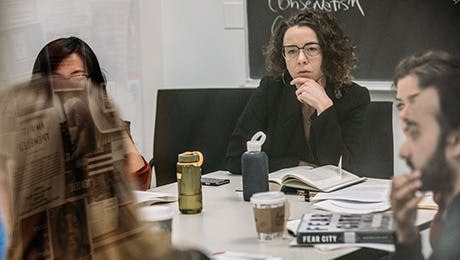 Her research explores a comparative view of post-World War I monetary and fiscal policies and she brings broad interdisciplinary engagements to her work in the history of economic thought and methodology. “Early Women Economists at Columbia University Contributions in the Struggle for Labor Protection in the Lochner Era”, chapter in Routledge Handbook of the Women's History of Economic Thought, Kirsten K Madden and Robert K Diamond Editors, Routledge, 2018. "Hawtrey, Austerity and The 'Treasury View'", 1918-25, forthcoming on Journal of the History of Economic Thought, 40(4), 2018. "Austerity and Repressive Politics: Italian Economists in the Early Years of the Fascist Government 1922-1925", European Journal of the History of Economic Thought (EJHET), Vol. 24:5, 2017. "A Decade After: a New Orography of Growth Patterns", LEM Working Paper, forthcoming on The Journal of Evolutionary Economics, co-authored with Francesco Lamperti.